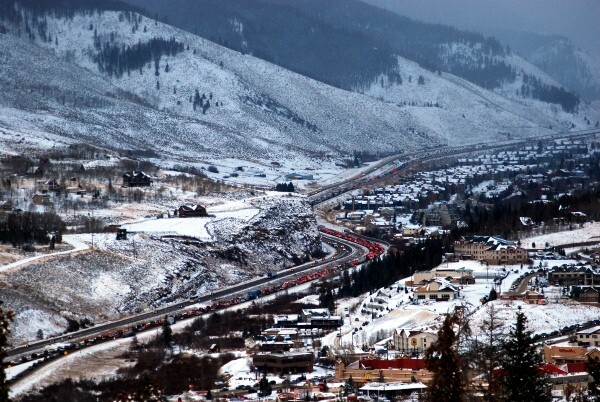 Interstate 70 traffic snarls in the winter. Colorado’s state Senate Transportation Committee on Thursday killed a bipartisan I-70 traction bill sponsored by Vail-area lawmakers Sen. Kerry Donovan and Rep. Diane Mitsch Bush aimed at reducing the number of motorists who cause road closures and delays on the Interstate 70 corridor in the winter. Dubbed the “I-70 traction bill,” the proposed law would have clarified that everyday motorists – not just commercial truckers — traveling in the state’s critical mountain transit corridor must have adequate tires, chains or alternate traction devices for their vehicles from Oct. 1 to May 15 between Dotsero and Morrison on I-70. The I70 traction bill also would have clarified law enforcement’s ability to enforce existing traction laws. Also sponsored by Rep. Bob Rankin, R-Carbondale, and Sen. Nancy Todd, D-Aurora, HB16-1039 was endorsed by a wide variety of public-safety agencies, businesses, civic and tourism groups. It’s estimated that for every hour that I-70 is shut down due to a spun-out motorist, the state suffers an economic loss of $800,000, and that Colorado ski areas lose business to Utah and other ski destinations that have better, more reliable access between major airports and the slopes. Western Slope Republican Sens. Randy Baumgardner and Ray Scott joined Greeley Republican Sen. John Cooke in killing the bill for the second straight session on a 3-2 party-line vote. The bill had passed the Democrat-controlled House 46-18 in February. Discussion of the bill the last two sessions has increased awareness of the issue and prompted more inquiries about tire safety and traction in the winter months, according to some observers. Parts manager Terry Palko of Phil Long Ford in Denver says people were coming in last fall asking about new tire-traction laws after seeing news reports. He estimates between 10 to 15 percent of his customers last fall came in specifically asking about news reports they’d seen regarding the proposed traction law. Palko points out that Phil Long Ford in Denver has always done brisk business in tire sales.